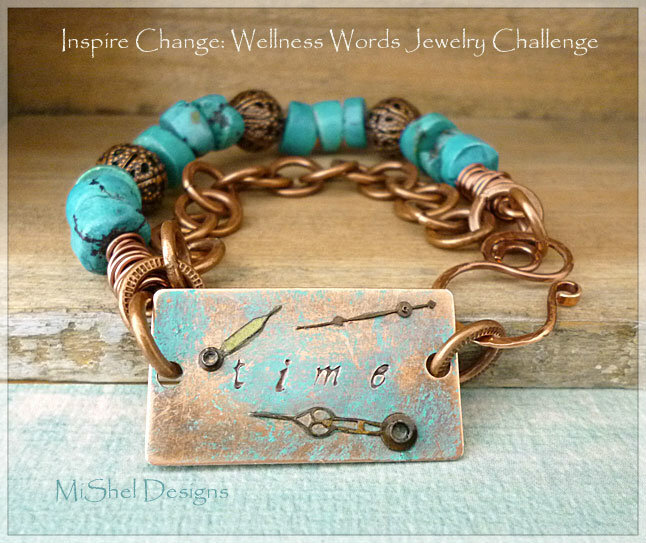 MiShel Designs: 2 for 1 Today!! Today's a busy day here in blog land! Part 1 of my post is at the top and Part 2 is towards the bottom. If you stick around for all of it you'll see why I didn't just provide links to the separate events! First up we've got our normal Saturday post this year for Focusing On Life: 52 Photos. This is Week 5. For Week 5 Sally, of The Studio Sublime, told us that our prompt was to "Capture Our Hearts" and find hearts in our every day lives. We were to look around and notice the hearts that are all around us. I really didn't think I'd find any hearts around me, even with Valentine's Day approaching, but I couldn't believe all the hearts I found in my daily life. Sad to say, I didn't find any really cool ones out in nature while on any walks or anything, but inside was a different story. Top: The earrings I wear almost daily (duh!). Bottom: Wall hanging over at my friend Dyann's house. Hanging in my bead cabinet are the two heart necklaces that Logan (a.k.a. 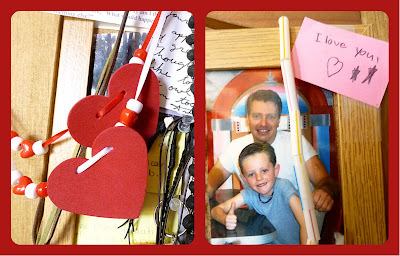 The Masked Rider) made us for Valentine's Day when he was in Kindergarten and also his little "I Love You" note that hangs above his 'sock hop' photo from first grade with him and the hubs. Hard to believe the kiddo's practically grown now!! I will not be taking these for granted every day when I open my bead cabinet anymore, that's for sure!! Hop on over to The Studio Sublime and see all the Hearts everyone else captured, okay?! Now for Part 2 of our agenda this fun Saturday. hosted by Tracy over at Make Bracelets Blog. "I’d like to start the year together with a healthy jewelry making challenge. 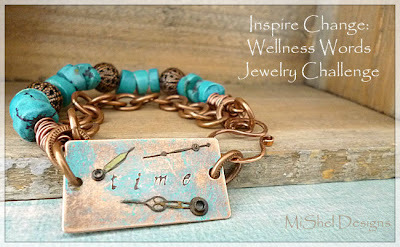 Yes, that’s right, a “healthy” jewelry making challenge. It involves choosing a powerful word or phrase that is meaningful to you and incorporating it into a jewelry design that will serve as a reminder to make a positive change in your life. These are the six categories of wellness that people generally want to make changes in: Physical, Emotional, Occupational, Spiritual, Intellectual and Social. Your words can represent any of these areas." So, long story short (yeah like that's gonna happen, right?! ), I thought quite a bit about my word and/or phrase and here's what spoke to me. You normally won't hear me mention religion or politics on this blog (and I'm only mentioning one today), so listen up. Even though I was baptized in the Christian church when I was in the 4th grade, I don't follow a specific religion, nor am I what anyone would refer to as a religious person. Spiritual? Yes, absolutely. Do I pray? You betcha!! Prayer is powerful stuff!! I believe in "God/Spirit" (my own definition mind you) but I'm not religious. However, I do love talking to my friends and learning about their various religious beliefs; they fascinate me and I have a great deal of interest in the history involved in many religions as well. So, with that said, I was over on Lori Plyler's blog, Studio Waterstone, (Lori did my blog banner if that name sounds familiar and she also hosts "I heart macro" each Sunday) and she had a link posted to a series of video sermons that she said was definitely worth checking out - so I did. WOW!! Not only were they funny in spots and really eye-opening, (and yes, religious or not, you should check out these videos) but on a couple of occasions, tears just ran down my face! "My time is limited, So I need to limit what I do with my time." Think about that one. I know. It's a show-stopper, huh? "When you begin to live as if your days are numbered you will gain a heart of wisdom." I'd like a heart of wisdom. So, once I get it through my head that my time is limited and that I must limit what I do with my time (and once this becomes the norm for me), I will start to gain a heart of wisdom. I mean, how can you not operate from a position of LOVE if you have a heart of wisdom? And my question here is this, "Shouldn't we all want to operate from a position of love?" So, my word is TIME. I need to remember that my time is limited and start limiting what I do with my time and spend that time wisely - from my heart. Do you remember what Tracy's words for us were? "These are the six categories of wellness that people generally want to make changes in: Physical, Emotional, Occupational, Spiritual, Intellectual and Social." So, where and how are you going to spend your TIME (more of / less of) in these areas above? while the swirl in the clasp represents how our energy is never ending. It was a real eye-opener for me to think about each of these and see how I wanted to organize/budget my time and this bracelet sits on my wrist, next to my watch, reminding me that my time is limited! 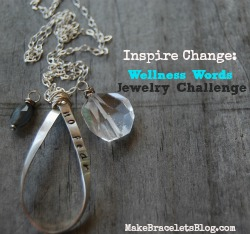 Okay, I guarantee you I'm not the only one who had some deep revelations over this one, so head on over and check out all the awesome jewelry from the participants for Tracy's Wellness Words Jewelry Challenge! I bet you'll find some words and/or phrases that speak volumes to you, too! Thanks so much Tracy for Inspiring us to make positive changes for our over-all health, wellness and well being - what an awesome gift! It is awesome how you linked the two hops together. 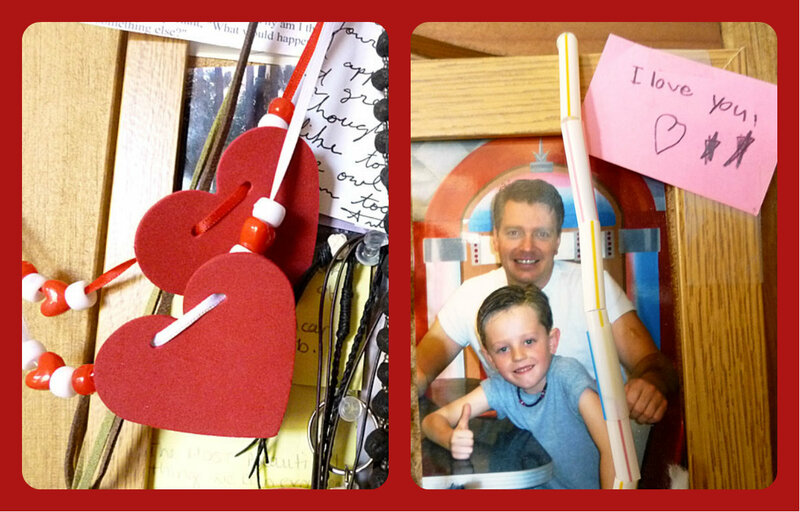 I love your hearts and the necklaces your son made are adorable. I love your bracelet. It has so much meaning and is so beautiful. I know you will enjoy wearing it. Hi Shel. Wow! I love how you thought about this challenge and the way you arrived at your word. Your altered blank is really neat and the meanings you placed on each piece of your bracelet, the turquoise, the links, the hands, the chain. It is really special. Thanks so much for participating! You're welcome Tracy - thanks for coming up w/such a fun and meaningful challenge/blog hop!! Love all your hearts, but especially the ones your son made. I know those will always be special. Also like your "Time" bracelet. Thanks - yes, the ones my son made are super special to me! Great post! I came for the Photo Challenge and stayed for the Wellness one...nice work! What fun hearts you found. The ones from the kids are always the best! I love that train of thought and how you came to choose and create your time bracelet. Pretty cool how the two hops connected for you! Yes, I thought it was cool how they ended up connecting too,...sometimes things just come together like that and you know they are meant to be. The word challenge has been quite an eye opener! I have read some very interesting stories. Love your piece, love how you chose it. Thanks for sharing it with us all. You're welcome and thank you for the nice compliments! A great way to link your projects! And if I am not mistaken, there is a little heart shape on one of your clock hands! Someone else saw the heart, too - I hadn't really noticed it until you guys both said something. lol...you and I have a whole lot in common! Loved how you found all of those hearts around your home, and finishing up with the most important hearts...your loves. How wonderful is that? As for your second hop...wowzers..have a lot to look up and check out there..love where you went with the time aspect...and how powerful those sermons must be to have affected you like that...my interest is so peaked! And the physical reminder of your intention is so beautifully done. 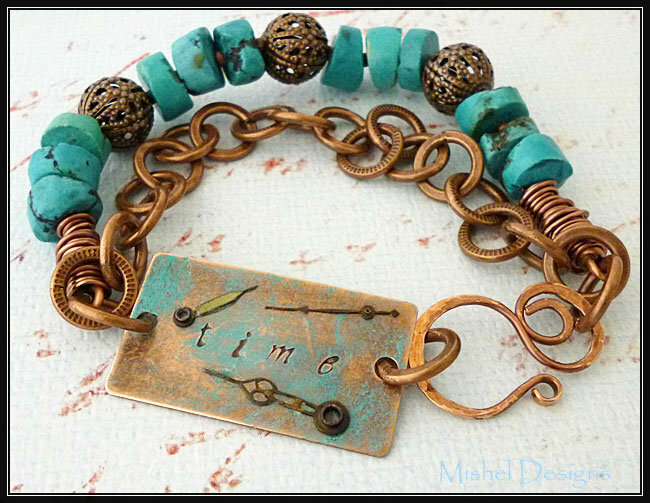 The turquoise is beautiful,(so is that patina!) and I think is often called the Truth stone...so this was a perfect stone to choose..for many layered reasons. Lovely post...and I am excited to see where your links take me! You're right! Turquoise is referred to as the truth stone - I spaced that out completely :-) And, like I said about those sermons, you will laugh, possibly cry at some point, but they will definitely make you think! They're each about 40 minutes or so long, so I listened to a couple of them while I was reating jewelry over the last couple of weeks. "My time is limited, So I need to limit what I do with my time." Wow, this IS a show-stopper sentence! I need to print this one out and tack it somewhere where I can see/read it every day. Our time is so limited which makes it incredibly valuable. I will remember to return to these words before making further commitments and choose wisely. Thank you for sharing Andy Stanley's sentences with us and I look forward to hearing more. Time-Keeper! I love it! And yes, those words spoke volumes to me and were right in line with how I'd been thinking for several months,...since last summer or longer actually (I'm a bit slow on the uptake! LOL!!). 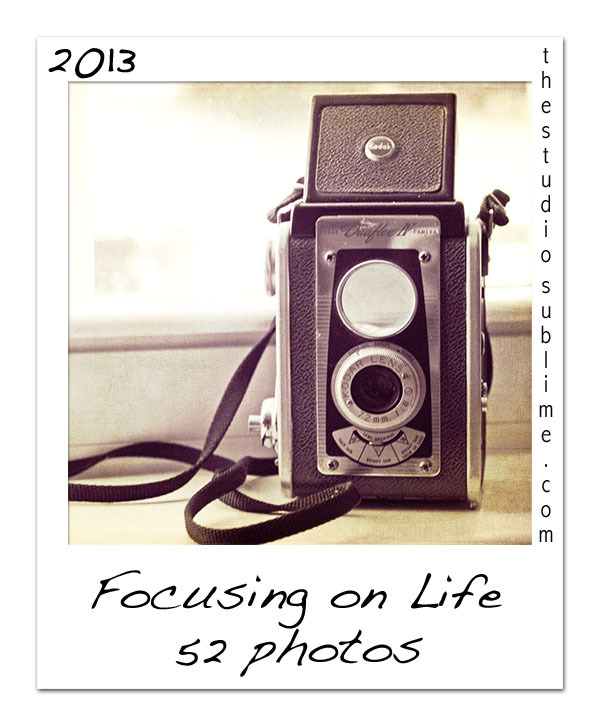 Oh yes - Sally's prompt this week was so appropriate for your second blog hop! I really do love posts that I have read that include little snippets from everyone's children and/or significant other! But the word TIME does speak volumes here.. lots to think about after reading your post. And last, but certainly not least, your bracelet is divine! Thanks Patti! And yes, it is nice getting to see bits and pieces of each other's lives that doesn't include art or jewelry once in a while, isn't it?! Both posts were wonderful. Love the heats you found but had to giggle about the ones you "found" in your ears. Awwwww! I laugh every time I see 2 notes from one of my twins.."I love Mom"..."I hate Mom" lol yup that about sums it up! I immediately wrote that quote in my notebook to refer back to, thank you for sharing it. I love the translation of the components of the bracelet, such a perfect interpretation of your epiphany! And the hearts, isn't it funny, I find I am still looking and finding hearts in everyday surroundings, even had my family finding some and pointing them out to me! the world really could use a little more heart but at least we are doing our part here to make a difference and help it to spread! great post Shel! You know, it seems to be an amazing TIME we are living in right now. I've seen a common theme running throughout the posts of this challenge. There's this understanding and recognition of inner spirit, of acceptance of ourselves and others and the importance of self-love before we can do anyone else any good. I guess that does make sense since the nature of the challenge involved deep inner reflection, but I feel like we are all on the same wavelength more than ever before. I'm feeling there's this shift in mind set no matter what our beliefs are. Your bracelet is beautiful and that focal is amazing! Fantastic Shel! 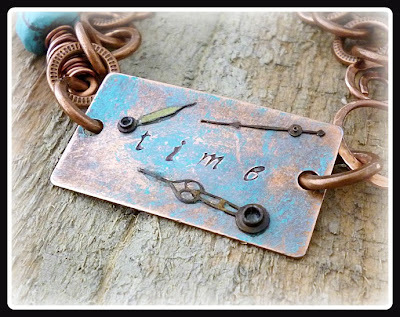 love all the layers of meaning you wrapped into this bracelet it is a very succinct thought. Yes what a different world we would live in if we all started from a point of love. I even see a heart in your bracelet! So much to appreciate in your post, Shel. But I'll have to zero in on your many Valentines. Love those earrings! I'd being wearing them every day too. And thanks for sharing your treasured mementos of your two sweethearts. These precious things keep us going, don't they? Time is such a powerful word, isn't it? I love your bracelet, and reading about how you were inspired to create it.